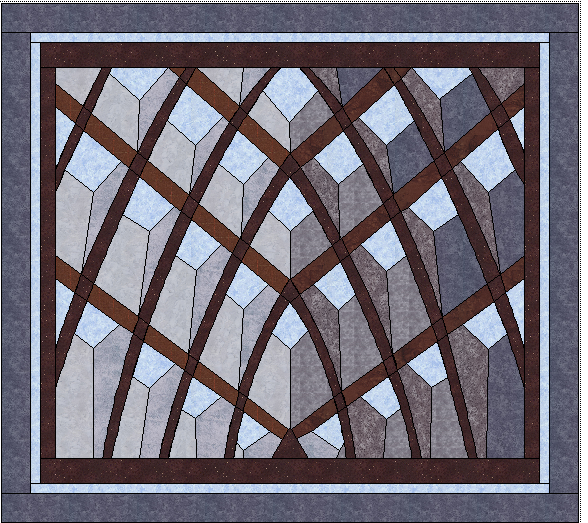 This quilt was designed from the inspiration of a Shopping mall arched roof that a friend had posted on her Facebook. I could not resist to turn it into a quilt.. I love to challenge my designs skills and eventually this will be a challenge to sew together. Oh Boy… how I love Y seams. Actually they are not that difficult once one understands how to do them. Later I will show you a quilt that is all Y seams that I have being tested at the moment. If one looks around with open mind we can see quilt designs in everything from Nature to architecture. This is the portrait that I took the inspiration from… It is the domed ceilling of the “Haleria Kaufhof” demartment store, Alexanderplatz, district of Mitta, Berlin. here is a link to more photos or this lovely Ceiling. https://www.flickr.com/photos/tags/GaleriaKaufhof. Previous My start into the Blogging world. Next What to do with those square Panel Blocks?